One of my friends, Italian architect and artist Claudio Varone, makes not only beautiful wall tapestries with colourful felt but also the best spritz ever. He uses Campari to give the spritz its bright, shiny colour and the typical, slightly bitter taste, but in some areas of Veneto (the Italian region where spritz comes from) this cocktail can be made with Aperol (a bit too sweet for my personal taste) or with the very bitter Cynar, made with artichokes. Yesterday evening we enjoyed Claudio's spritz and I finally managed to "steal" (grazie Claudio!) its recipe after so much time that I wanted to publish it on this blog. Because Claudio prepares spritz directly in the glasses and not in a big carafe, the listed ingredients are enough for one person. If you don't have any Prosecco, use dry white wine and a bit of mineral water with gas for the necessary bubbles. Mix Campari, Prosecco and a dash of gin. Add some mineral water if you want a lighter spritz and a couple of ice cubes. 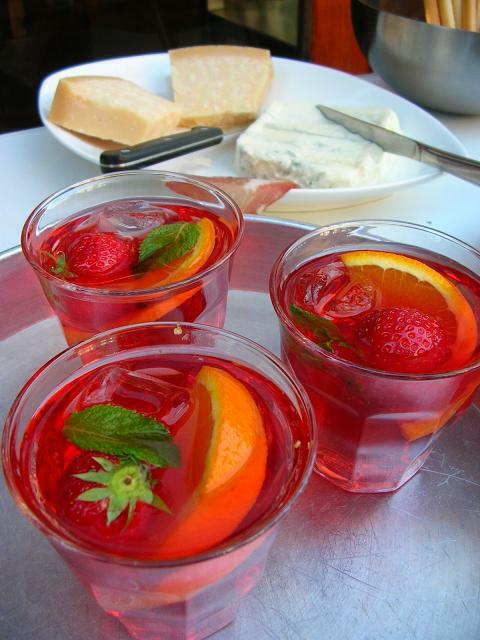 Garnish with a slice of orange, one whole strawberry and a mint leaf. Thank you Niall, nice to "meet" you and to see you cooking eagerly on your website! I'll come and visit often, ciao! I work in a wine cellar and we always get peeps coming in asking for prosecco, gin, and campari for these. Seems like lots of people try them in Italy and can't kick the habit. Anyways, I'll have to give them a try because they look too refreshing to pass on. Ooh Nicoletta! This looks positively refreshing and delicious! I just love the colors and the fruits! Paola, I read your comment only now, sorry for the late answer! Thank you for your greetings, I guess the weather we're having the last few days is not exactly what we'd like to see here, is it? ;) Ciao! Manuel, like there's not an "original" bolognese sauce (everyone will tell you their sauce is THE original) the'res not an original spritz. 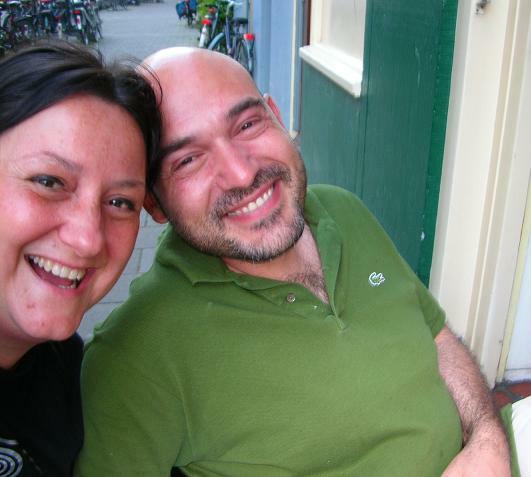 If you ask my friend Antonella from Padua, for example, she will tell you that her favourite spritz is made with Cynar. some like Aperol, some like Campari. If you travel around in Veneto you'll find lots of versions. 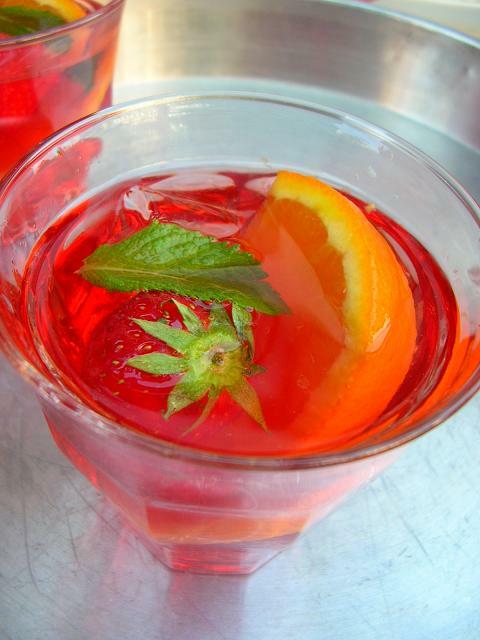 I agree with Manuel, a strawberry on a spritz? I never found in Venice, the city where i come from, a strawberry on my glass of spritz. Anyway, good receipe for a cocktail. Ever heard of the words "fantasy" and "innovation" and of the expression "out-of-the-box", Francesca? ;) Ciao.